With a growing global population and a finite amount of arable land, feeding those increasing number of mouths will present many challenges in the years ahead. Maximizing crop yields with the use of fertilizers will be crucial, and potash will play an important role in helping those plants grow by aiding in the development of strong root systems as well as in the retention of water. Few countries have a greater need for potash than Brazil. The South American giant is currently the third-largest global importer of potash, with more than 90% of its supply coming from other nations. Potash consumption in Brazil is, in fact, forecast to grow from 8.1 million tonnes to 9.7 million tonnes by 2015, with the Brazilian government targeting to reduce imported potash dependency from 91% to 60% during the next five years. With the country’s only producing mine, Taquari-Vassouras in Sergipe, expected to be depleted by 2016, Brazil’s Amazonas Potash Basin may provide much of the nation’s future supply. Vancouver-based Pacific Potash Corp (TSX: V.PP), led by venture capital veteran Balbir Johal and former Brazil Potash chief geologist André Costa P.Geo., is one of a handful of companies looking to develop the Basin. 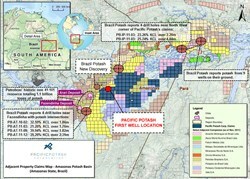 The company represents the sole public potash play in the Amazonas Potash Basin. The properties are situated approximately 20 and 40 kilometres from Petrobas’ Arari and Fazendinha historic deposits, which are estimated to contain 1.1 billion tonnes of potash. Pacific Potash’s ambitions were given a boost by a company announcement on October 29, 2013, that it has entered into a $10 million non-binding Memorandum of Understanding (M.O.U) with a Chinese State Owned Enterprise (S.O.E). It involves a Convertible Debenture financing exercisable at a price of $0.37 per common share, bearing 5% interest and maturing two years from the date of issuance fully convertible into common shares of the company. “We expect this $10 million financing agreement to be finalised in the next 60 days. We already have a group of Chinese investors who are committed to growing the company with us in Brazil, so there is great synergy in this potential partnership,” said Pacific Potash Executive Co-Chairman and Director Balbir Johal. The group of Chinese investors he is referring to is CapitalAsia, which represent both a cornerstone investor in Pacific Potash’s project and a strategic advisor. The firm has in place a non-binding M.O.U in place with Pacific Potash that sets out the initial terms and conditions for entering into a formal off-take agreement at such time as Pacific Potash's Amazonas Potash Project goes into commercial production. Their expertise and advice to Pacific Potash was instrumental in the forging of the new relationship with the Chinese S.O.E. Upon completion of this financing Pacific Potash will have raised a total of CDN $16.35 million year to date, $12 million of which will be used to complete a fully permitted drill program, consisting of up to six exploration holes with each reaching a true depth of approximately 1400 metres. The program of course will be lead by local Brazilian, Andre Costa, whose resume also includes extensive potash work for the Saskatchewan Geological Survey and Northrim Exploration LTD.
Pacific Potash’s Amazonas Potash Project is across the river from the city of Itacoatiara, which has the second largest soybean export terminal in Brazil. Currently soybean barges return to the southern farm belts empty. This offers a potential back hauling synergy to deliver potash directly to domestic Brazilian markets. With direct access to waterways and no lengthy rail haul requirements, Pacific Potash’s logistical cost savings are estimated to be up to $167 per ton. This logistical cost advantage, similarity to Saskatchewan’s deposits and Brazil’s insatiable apatite for the commodity allows for several viable economic potash project in this region of Brazil. This comes at a time when companies operating in historic potash basins are struggling to develop new economic deposits due to lack of infrastructure and increased shipping costs. Pacific Potash’s exploration is targeting potash occurrences amenable to solution mining, which provides benefits such as substantially reducing overall Cap-Ex, increasing scalability, shorter time frames to production and limiting environmental impact.